A cyclist is waiting to find out if he has become the fastest person to ride around the world on a bike after arriving back in Trafalgar Square. Phil White, 24, from Ottershaw, Surrey, began the 18,000-mile ride from London on 19 June last year. 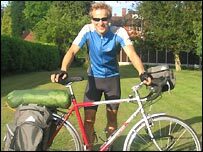 He cycled through deserts and jungles and over mountain peaks across the Middle East, Australia, China, and America to raise £1m for Oxfam. He was greeted in Trafalgar Square by family friend Sir Cliff Richard. After arriving back in central London on Sunday, Mr White leapt from his bike and threw it to the ground, saying: "I've being looking forward to this moment for months. "I'm so pleased to be back in England, I've been literally exhausted for the last 10 months." Sir Cliff, whose GP is Mr White's mother, said: "I think it's fantastic that a young person has given up that much of their life, 10 months, to cycle around the planet. "To him it will mean a great deal; you cannot go through that arduous task without learning something. This journey will help him both physically and mentally." Mr White, a former business student, has spent more than 1,300 hours cycling and rode more than 150 miles in one day alone. One of his worst moments was when he was chased by bandits in 45-degree heat in Iran. His supporters have collated data from his journeys to submit to the Guinness Book of Records. They believe the journey probably took around 299 days, once the days spent travelling by train or ship are removed from the calculations.